When they were building the N tractor were they running 7 days a week or 5 days? Yes, what Gaspump said about the foundry is correct. The blast furnaces were only shut down to clean and repair. The refractory brick lining needed to be replaced every so often but there was always another furnace going before one was shut down. Tractor production was always secondary to car and truck and only ran one shift. Parts availability dictated too if the line ran on day shift as well. I believe Charles Sorenson said in his book, a 6-day work week was the norm. Holidays were worked too, at least early on. The exception was Christmas. 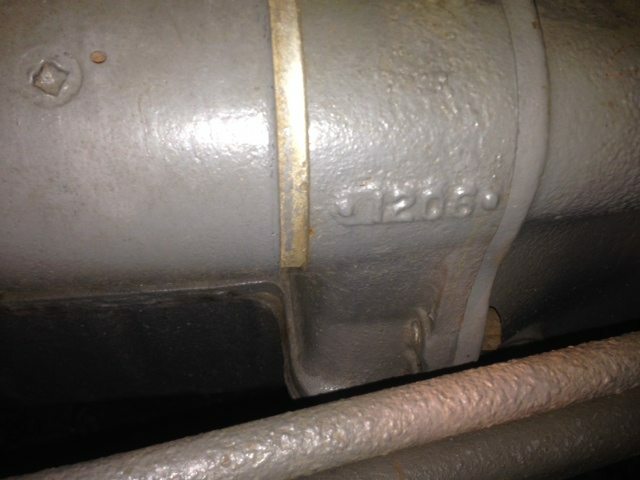 Your casting code looks to be "I206" which is defined as September 20, 1946. Henry Ford's 5-dollar a day plan was meant to deter the UAW from coming in but after they did, changes were made out of Ford's hands. On February 10, 1942, all domestic commercial car, truck, and tractor production was halted at Ford plants ( ALL US plants for that matter, not just Ford ) per the US War Board decree that all US manufacturing was to now be directed towards the war effort with only basic necessary products for domestic use made. Up til then, the 9N model was produced. The 2N model didn't begin rolling off the line til October 1942 and those were the first wartime steel-wheel/magneto models. By April, 1943, Ford was back to standard 2N (on rubber/electrics) models. Production was slow as part suppliers also had to ramp back up with new parts so the line was down a lot then as well. Henry Ford adopted the five-day work week in 1926. No idea if/when Ford was running 1, 2 or 3 shifts. Manufacturing plants generally add a second shift and then a third shift when necessary to increase production. Not an assembly line situation. The steel mill and foundry likely ran 24/7, hard to shut those blast furnaces down.